Sweden's PM Stefan Löfven (centre). Credit: Trafikverket. Swedish prime minister Stefan Löfven officially opened Stockholm’s City line at the weekend – the city’s first new railway line in almost 150 years. 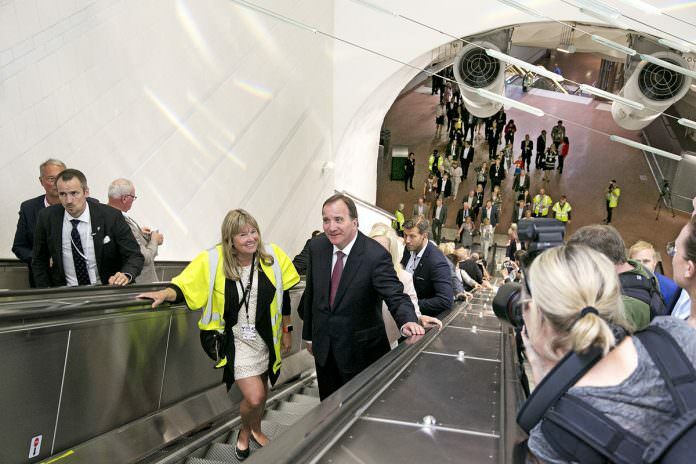 The inaugural service left from Stockholm Odenplan for Stockholm – both of which are new stations – on July 9. The commuter line is also known as the Citybanan and runs beneath the capital city. Construction began in January, 2009, and on July 10 it was opened to the public. Stockholm City Line was built by the Swedish Transport Administration Trafikverket in co-operation with the City of Stockholm, Stockholm County Council and Stockholm Transport, SL. On its website, Trafikverket says that 80 per cent of rail journeys in the country begin or end in Stockholm and that the new line creates room for twice the number of trains through the city.